The renamed Stardust-New Exploration of Tempel mission -- Stardust-NExT -- passed within about 113 miles of the nucleus of Tempel 1 at 11:38 p.m. EST, using its navigation camera to snap a string of images and collecting data about the dust environment in the immediate vicinity as it raced past at a relative velocity of 24,300 mph. Engineers at the Jet Propulsion Laboratory in Pasadena, Calif., expected five images from the point of closest approach to be downlinked right away, but a glitch of some sort resulted in the pictures coming back to Earth in the order they were taken, starting with the most distant view. As a result, flight controllers said it would take six hours for the long-awaited closeups in the middle of the 12-hour playback sequence to be received and processed. "We're facing a situation where we sent the commands we had planned, anticipating the middle five images of the 72-image sequence would be played back," said Chris Jones, a senior manager at JPL. "What we got instead, we went to the top of the stack and the first picture we received was the first image." He said the initial long-range photo showed "the targeting is quite good. We've got the comet essentially in the center of the field of view. So, I think we're pleased with what we've got, we just haven't been able to get the spacecraft to behave the way we expected. It'll take about six hours at the playback rate to get us to those five images." As a result, a news conference planned for 1 p.m. to discuss the close-approach images will be delayed until 3:30 p.m. EST (2030 GMT). "We still don't understand fully why this didn't work the way we planned," Jones said. "But we believe we're going to return the data from half those 72 images by early (Tuesday) morning." The $300 million Stardust mission was launched in 1999. 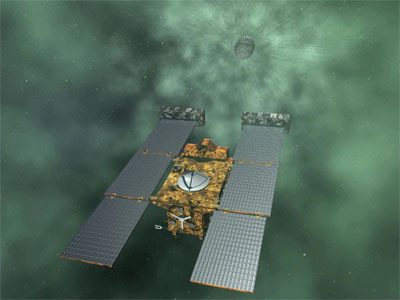 On Jan. 2, 2004, the spacecraft flew past comet Wild 2, using an innovative collector to capture particles from the coma, the cloud of debris surrounding the nucleus. Passing back by Earth two years later, a small re-entry capsule carrying the collected material was ejected and fell to a landing in Utah where it was recovered for detailed analysis. In the meantime, NASA carried out the Deep Impact mission, sending another spacecraft to comet Tempel 1, a roughly potato-shaped body with a nucleus measuring 4.7 by 3 miles. During a dramatic encounter in 2005, Deep Impact released an instrumented probe that crashed into the comet, throwing up a cloud of debris from the surface. The Deep Impact spacecraft monitored the crash from a safe distance and carried out remote observations with cameras and other instruments. But the cloud of debris, or ejecta, thrown up by the Deep Impact probe prevented scientists from seeing the crater the crash excavated. Joe Veverka, the Stardust-NExT principal investigator, said Tempel 1 turned out to be "unusually interesting." But Veverka said the most important reason to return to Tempel 1 is that "this will be an opportunity, for the first time, to see how much a comet changes between two close passages to the sun." One year ago, engineers carried out a major rocket firing to put Stardust-NExT on course for its Valentine's Day encounter. The trajectory was selected based on careful studies of the comet's estimated 41.9-hour rotation. The goal was to make sure Stardust NExT had a view of the Deep Impact crater as it flew past. "That impact threw up so much ejecta that Deep Impact never saw the crater," Veverka said. "So it could never complete the experiment, to see how big the crater is and what that tells us about the mechanical properties of the comet's surface. That's important if we're ever going to go back to a comet, land a spacecraft on the surface, dig up material from the surface, bring it back to Earth. ... So here, we have a chance to complete the deep impact experiment." But Steve Chesley, a co-investigator at JPL, said there were no guarantees. "If we've aligned our light curves correctly and the comet continues to cooperate ... then we'll meet our mission objectives and hopefully also have a fantastic view of the deep impact crater," he said. "But the alternative is not so bad because then we'll get fantastic views of never before seen cometary terrain. So we'll have fantastic science no matter what." Flight controllers will not know whether they hit the bullseye until the fist images come in. "We won't know until a few hours after the flyby," Chesley said. "I'll be on the edge of my seat, but I think it's important to emphasize that aspect of the mission is bonus science. We're going to find out a lot about how comets evolve." Stardust-NExT has covered some 3.5 billion miles since launch in 1999. The spacecraft is not expected to have enough fuel left to carry out any additional encounters.